I’ve been so caught up in working on this project (and finals) that its been a moment since I posted an update, but I assure you, things are coming together nicely! 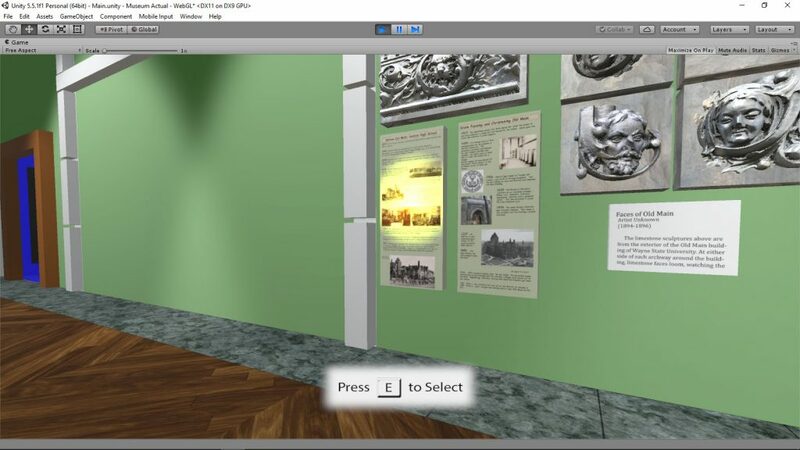 After testing the old user interface at a couple of events, it became apparent that the best way to have people interact with the museum objects would be to pan the camera and bring everything into focus within the world space. 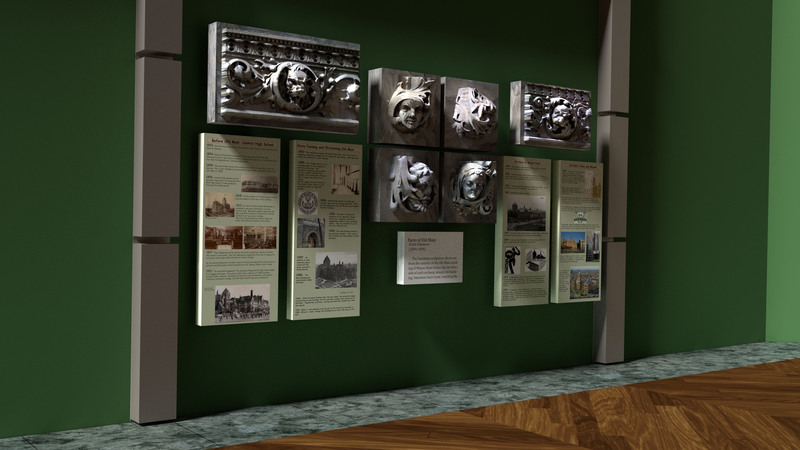 Previously the museum had separate scenes to interact with objects. A large number of new artifacts have been added, and the space is beginning to fill up. A series of pipes has been added to the area discussing the regulation of food and drugs. 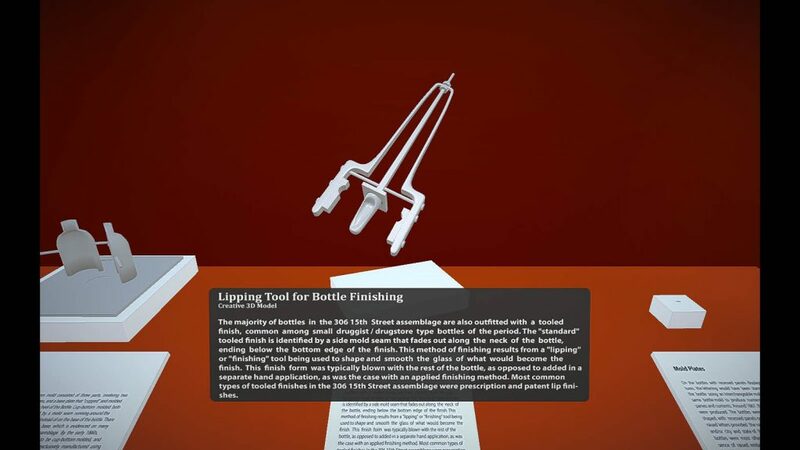 In order to explain how archaeologists date bottles based on their features, models have been made to explain the bottle production process when using cup-bottom style molding, finishing tools, and mold plates! The above animated GIF should provide a general idea of the interactions and additions that are making their way into the program. 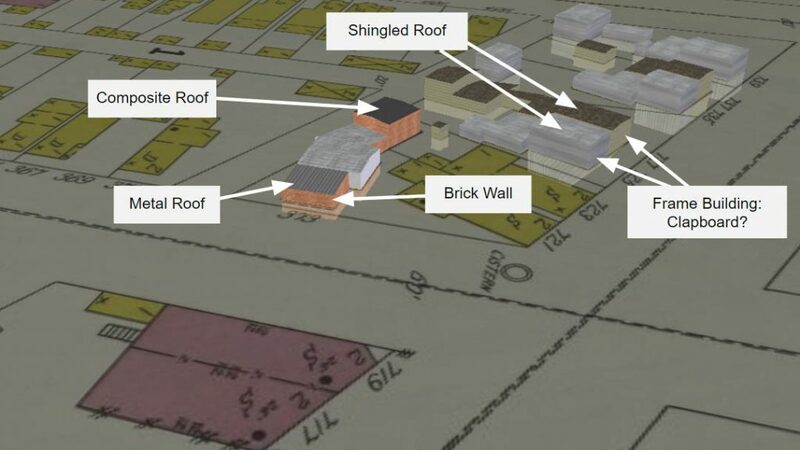 In order to be able to provide context for the “Medicine at Roosevelt Park” section, Sanborn Fire Insurance maps are being used to generate an accurate model of the park (from 1897), which will be used to show which houses we’re discussing, and their location in relation to releveant local pharmacists. This model will encompass the entire area of construction, which is pretty massive. The next task on our to-do list is to get all of the content in, and then start making audio files to read content to users. Check back soon for more updates! 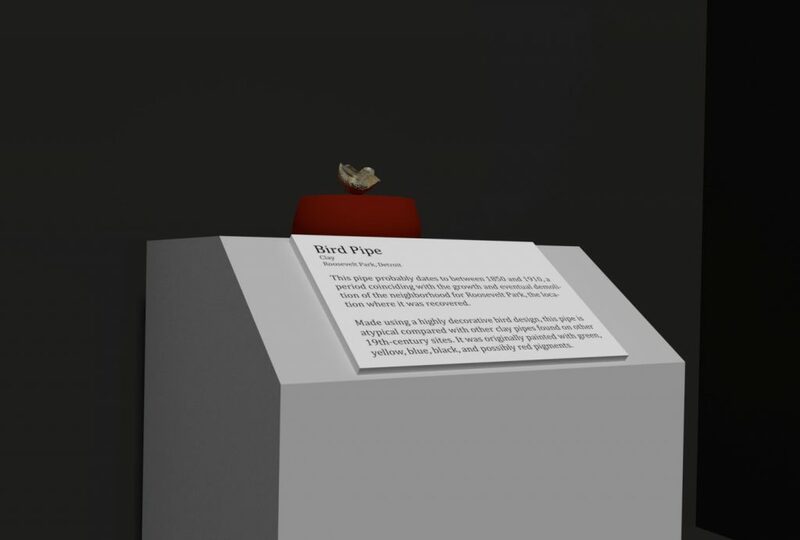 In the meantime, check out this sweet pretzel pipe that has been added to the virtual exhibit! Over the last few days I’ve been focusing on making installations selectable, and programming ways that users can move between material and objects. 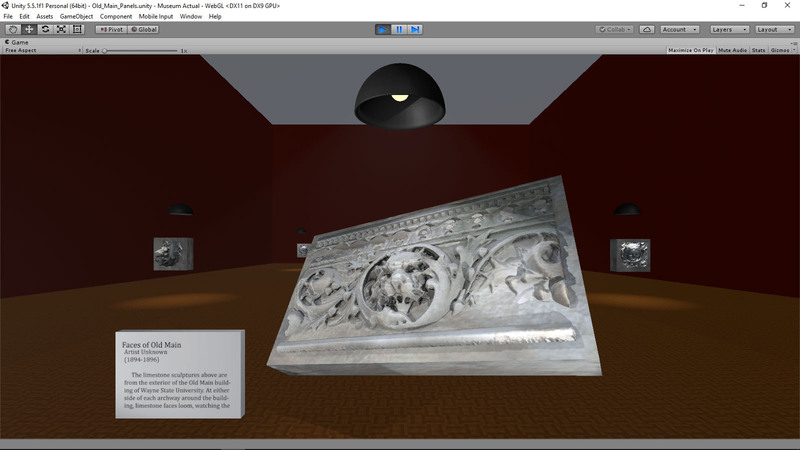 The current setup uses raycasting to make objects glow when you can interact with them, and then upon selection, an alternate scene is loaded that allows panels to be toggled through. Artifacts can be toggled through and rotated to inspect. Still coding, but felt like I should post a progress update. A lot is being tweaked on the side including lighting (which is currently volumetric), layout, textures, and label designs. 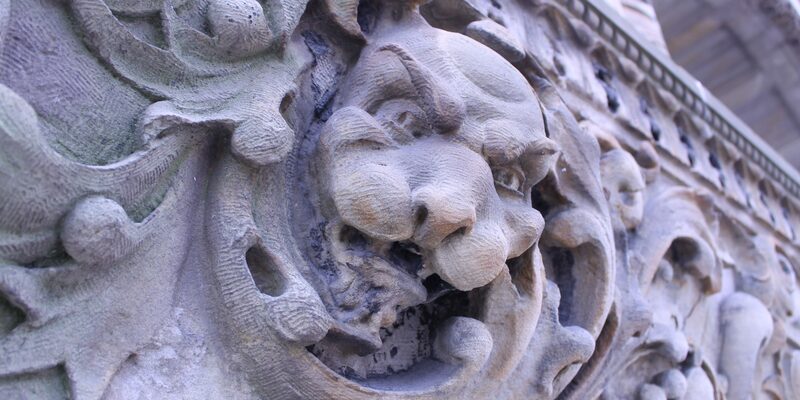 Check back soon for more news and info! Over the last day I’ve been working on taking all of our text and getting them into labels, and on the walls. We’ve only developed a rough layout of where the artifacts and programming material will be going, so many of the labels and artifacts are likely to get shifted around as we assess what else needs to be added. The preliminary layout for our Old Main installation is now in (but still needs to be reconfigured to be less congested), and we’ll be attempting to generate a model of the building to shrink down and place with the installation (fingers crossed). 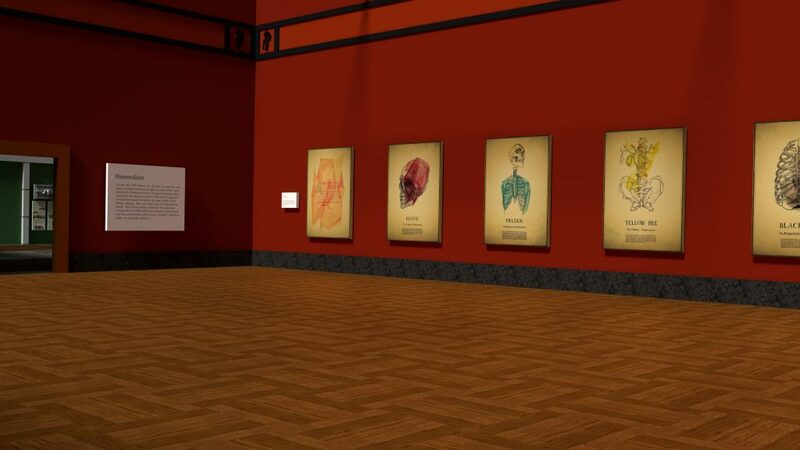 Our initial intent was to create an interactive model of the four humours for our exhibit section regarding early medicine, however, Irina Sidorova has been kind enough to let us display her beautiful work in the museum. An interactive model may come later depending on time constraints and the number of other creative assets that need to be built. 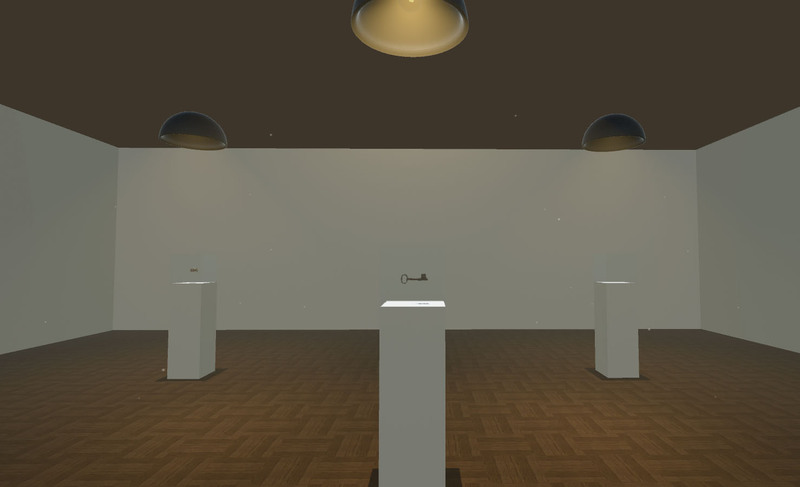 By the end of the week all of the labels and 3D models of artifacts will be in the space, and then we will begin assessing what other creative assets and 3D models are required to flesh out our exhibit. 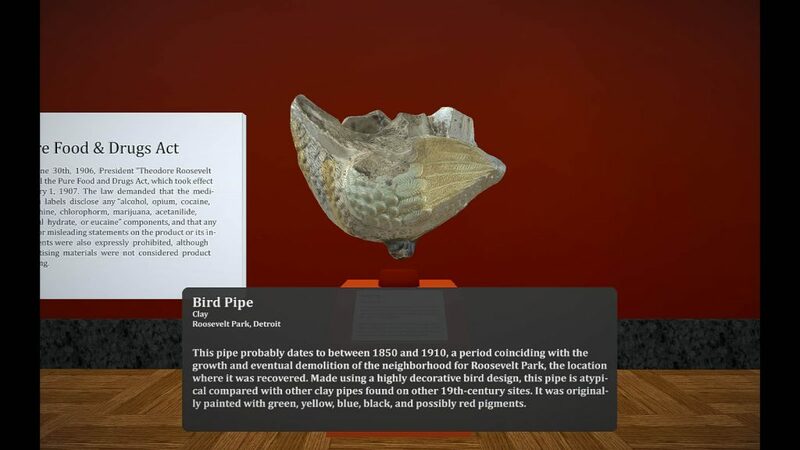 Although some of the artifacts are extremely small, like our bird pipe, the interface will allow users to pick objects up, zoom in, and rotate them in 3D! Check back later this week, as the development steadily chugs forward! Although most of the members of our virtual museum group had no prior experience creating software nor 3D models, after spending February running a month long workshop on how to use Blender, everyone has a grasp on creative 3D modeling and photogrammetry! Now that the workshop is behind us, development on the exhibit is in full swing! 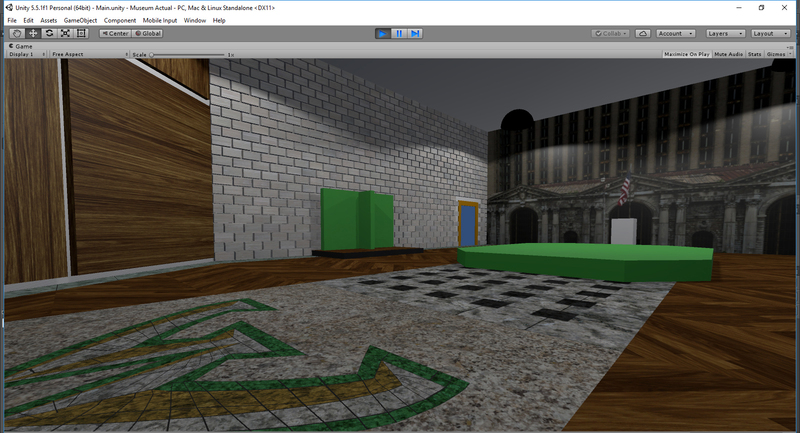 Samantha Ellens, Athena Zissis, and Sarah Beste are all working on putting together the 2D museum media, while Julia DiLaura and I are building 3D models. 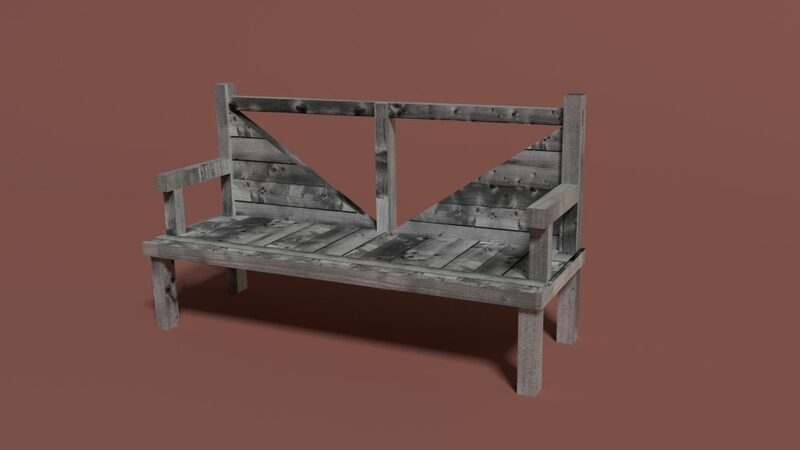 Julia just finished her very first creative 3D model of a bench, which we will be using in the entry hall. My primary task currently is to slowly massage the architecture of the museum building itself into something that is reasonably lifelike and appealing, while synthesizing everything the team makes into the 3D environment. 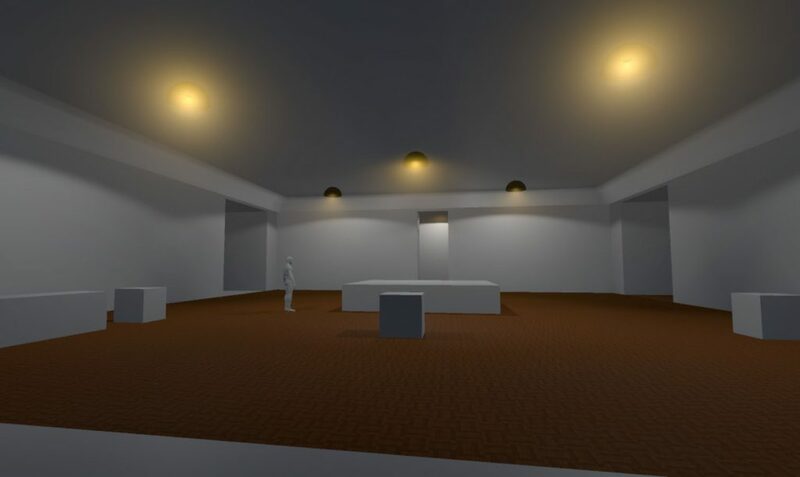 Once the installations are completely set up in the first room, I will begin working on user interface options (as currently the museum is a simple walking simulator). I’ll be posting every few days this month, so check back for more updates soon! But in the meantime, here’s a sneak peak at some of the cool stuff we’ll have in the exhibit! 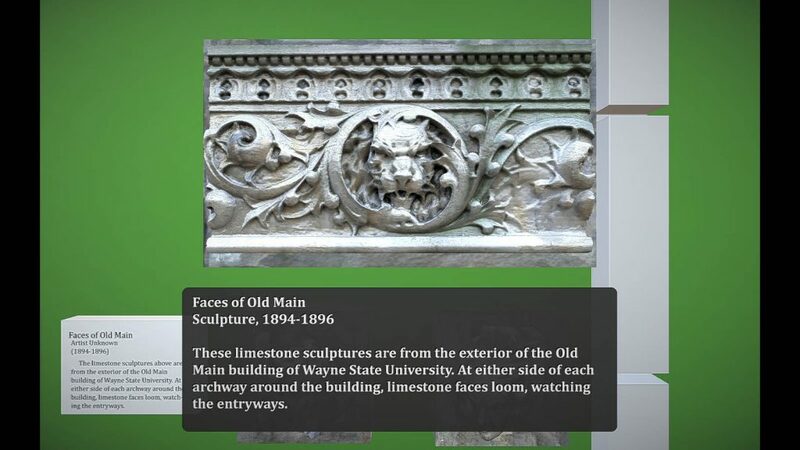 At the beginning of fall semester, I started a work group at Wayne State with the goal of producing an immersive first-person virtual museum exhibit. The team currently consists of myself, Julia DiLaura, Samantha Ellens, Terri Renaud, Shikha Misra, and Athena Zissis. Having no prior experience doing anything like this, the process has been taking longer than expected, but the current goal is to have the exhibit completed by the end of April 2017. Since the beginning of fall we have managed to create 3D models of about 20 artifacts to be displayed in the exhibit, with the above 3D model of a urethral syringe from the Detroit Renaissance Center excavations being one of them. We’ve also developed exhibit program material, and come up with a basic spatial layout for the exhibit. The current working title of the exhibit is “Coping with Illness at the Turn of the 20th Century: Remedies, Tonics, & Self-Medication in Early Detroit”. The exhibit will center around the transition from patent medicine to industrial medicine, and how this transition is reflected in the way people regard health and illness. 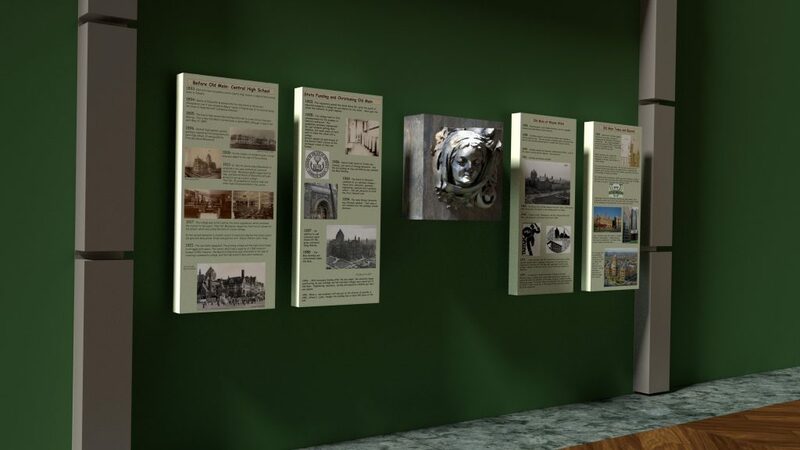 The hope is that the exhibit will not only act as a narrative about the history of medicine in Detroit, but also provide insights into the archaeological process, and how material culture can aid in interpreting the past. This month, the goal is to take our bare bones spacial layout and flesh it out into a realistic architectural space. Using museums as inspiration, image textures and design ideas will be sourced from real locations in Detroit and integrated into the museum design. Running parallel with this process will also be the development of a Graphic User Interface that will display the exhibit labels as virtual pop-ups, which should make them easy to read and more engaging. More to come at the end of the month! I’ve been busy trying to set up a virtual museum group at Wayne State, but work is still continuing on the Virtual Chert Collection! I’ve renamed the app to make it non-specific so that more regions can be added, and color corrected the models to the best of my ability. The models should now look pretty true to life, though I’ll likely go through them all again before the release and tweak things a little bit (Red channels are maybe slightly too strong on a couple). and improved user interface ! Click Below for the New Version of the Virtual Chert Collection! Found some time to fix a few bugs! Future releases will add the missing models, Munsell color correction, descriptions of each chert type, web optimization, click&drag / swipe rotation of models, and mobile device compatibility for tablets and phones (OSX & Android). 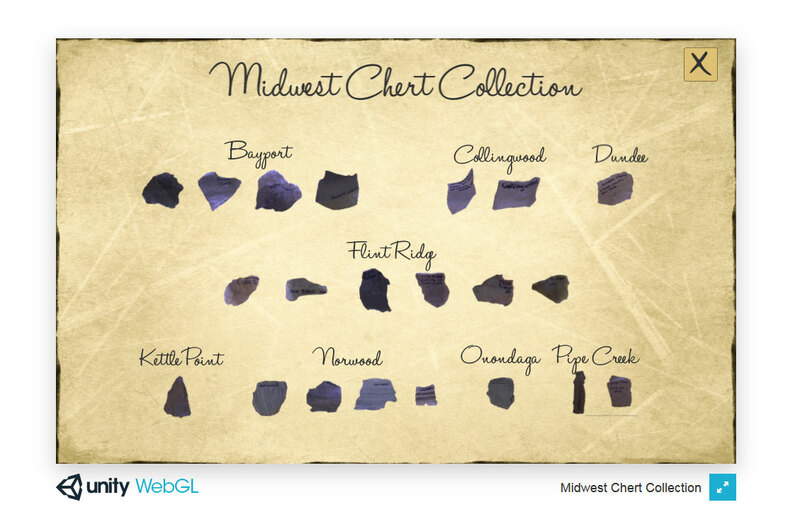 Click here for the web release of 3d Midwest Chert Viewer v1d. It takes quite a while to load currently as I have yet to optimize the models fully, so please be patient. It took me about 2 minutes to load fully from home. Special Thanks to Dr. Surface-Evans & Central Michigan University for loaning me the physical chert collection, without which, this would not have been possible. 3d Midwest Chert Viewer alpha v1b now available! 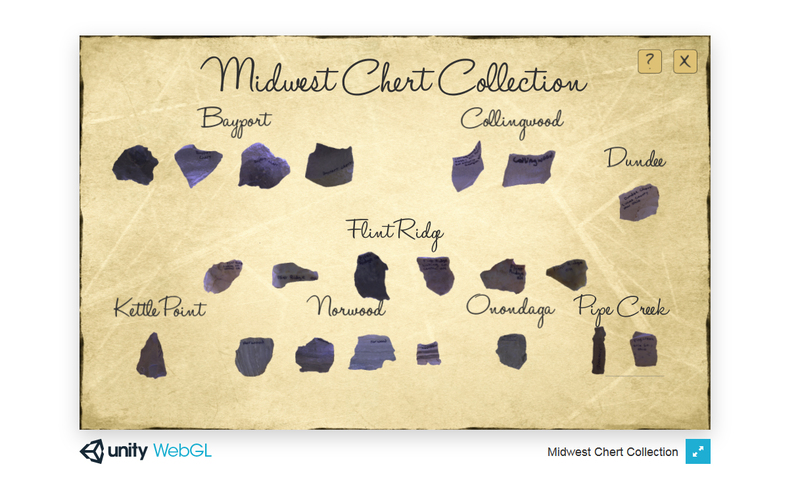 After a summer of processing models, the first alpha release of the 3d Midwest Chert Collection app is now available. This release is still missing 6 models, which will be added within the next week. 4 Flint Ridge models need to be reprocessed as they were cut off by the bounding box while processing. Models all still need to be color corrected with Munsell values. Model colors will appear off due to the lighting conditions under which they were captured. Help menu is currently disabled. Will be fixed on next release. Q and E keys can be used to toggle models. Input listening in webplayer tends to jump models, will fix next revision. The next release will add the help menu, and the missing models. Future releases will add Munsell color correction, descriptions of each chert type, web optimization, and mobile device compatibility for tablets and phones (OSX & Android). Click here for the web release of 3d Midwest Chert Viewer v1b. It takes quite a while to load currently as I have yet to optimize the models fully, so please be patient. It took me about 2 minutes to load fully from home.